WHILE motorists are finally permitted to travel on the New England Hwy from Warwick through to Toowoomba, it's evident it will be a bumpy ride for a little while to come. Though it is passable with traffic control on one lane at sections, Southern Downs Regional Council mayor Peter Blundell asked motorists to avoid the highway to Toowoomba wherever possible. He described the road, which was badly damaged in the flood, as "gravel". Meanwhile the Warwick-Allora Road is closed to all traffic due to significant damage caused by flooding in Glengallan Creek. A spokeswoman for the Department of Transport and Main Roads said the closure was effective between Upper Wheatvale Rd and Massie-Willowvale Rd, known as Glengallan Flats. 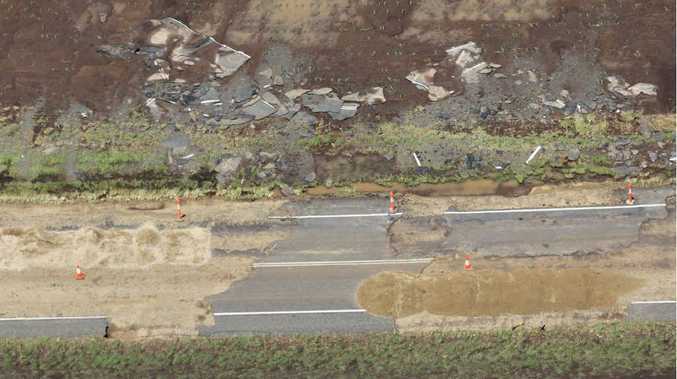 "Floodwater from the Glengallan Creek washed away parts of the road and the road shoulders, and caused severe erosion around culverts," she said. "This section of road was under reconstruction prior to the Australia Day weekend flood event." Damage assessments are under way at another flood-affected section of the road, near John Dee. The road was closed at this location on January 24, to enable reconstruction of a flood-damaged section of the road next to the Condamine River. TMR plans to update motorists on the status of the work as it goes ahead. For information on disruptions, visit 131940.qld.gov.au or phone 13 19 40.